It is often said that a bonsai specimen is no different from "regular" plantings grown in the wild. 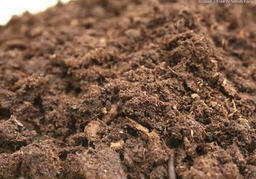 type of soil mix? That is, if bonsai are simply trees from nature in a pot, why won't they live well in common garden soil? that they might live, or would we rather endeavor to help them thrive under our care and training? growth of the specimen; in fact, it is often very harmful to the tree. supply a needed amount of moisture to the bonsai between each watering. rot, leading to a weakening and the possible eventual death of the specimen. 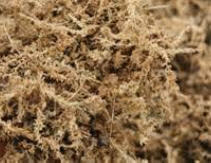 nutrients can start even before they are absorbed by the plant's roots. to control the application (when, quantity, and type) of nutrients that the tree will receive. 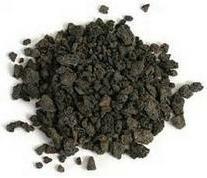 The above requirements for a bonsai soil are met by varying the ratio or blend of organic and inorganic materials. 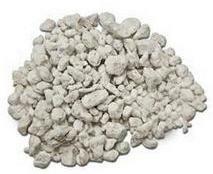 volcanic clay from Japan, similar to Akadama, slightly acidic), or all pumice etc. 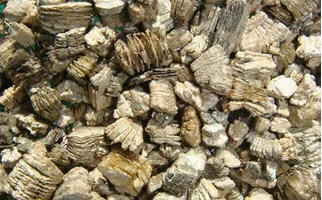 pine bark flakes (soil conditioner sold at many garden centers). This results in a 60% inorganic and 40% organic mix. is posted below. Screens may also be custom-made utilizing various sizes of common hardware cloth. 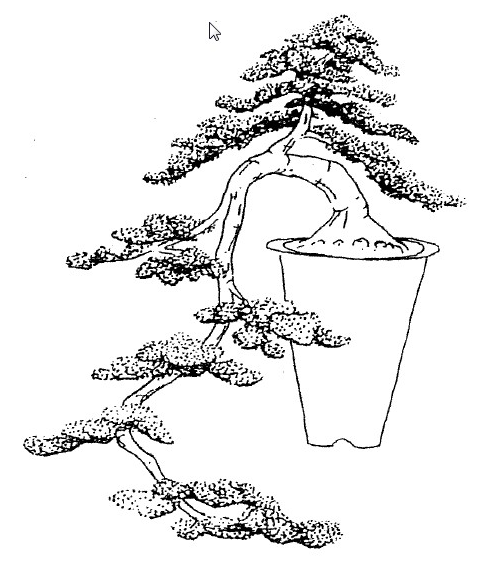 So, while bonsai will grow in common garden soil, it does not provide the best "foundation" for such cultured plants. to better suit a particular growing situation. 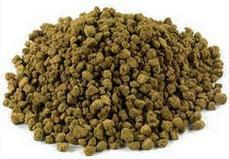 Akadama, specifically processed for bonsai potting purposes, is available through many bonsai suppliers. 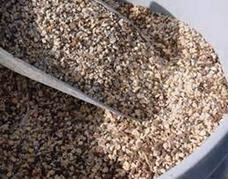 It needs to be sifted before use, and after about 2 years, it starts to break down, significantly reducing the soil aeration. with similar fired / baked clays that are easily available at most garden centers. without trouble. 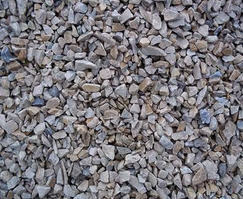 Fine gravel / grit is of great importance to create a well draining and aerated bonsai soil. 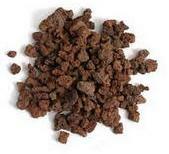 It is also used as a bottom layer in bonsai pots to enhance drainage. 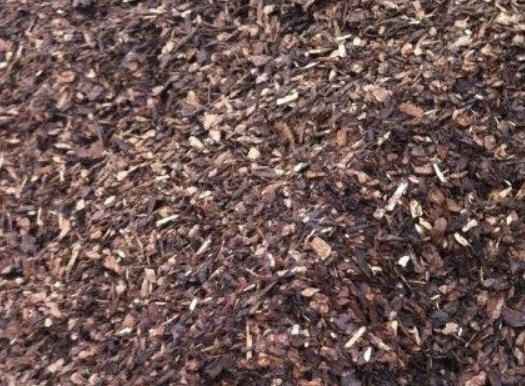 materials that can be considered for bonsai soil use. 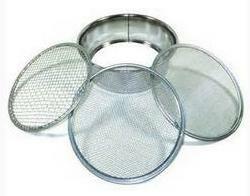 Used in sifting soil, thus eliminating "fines." 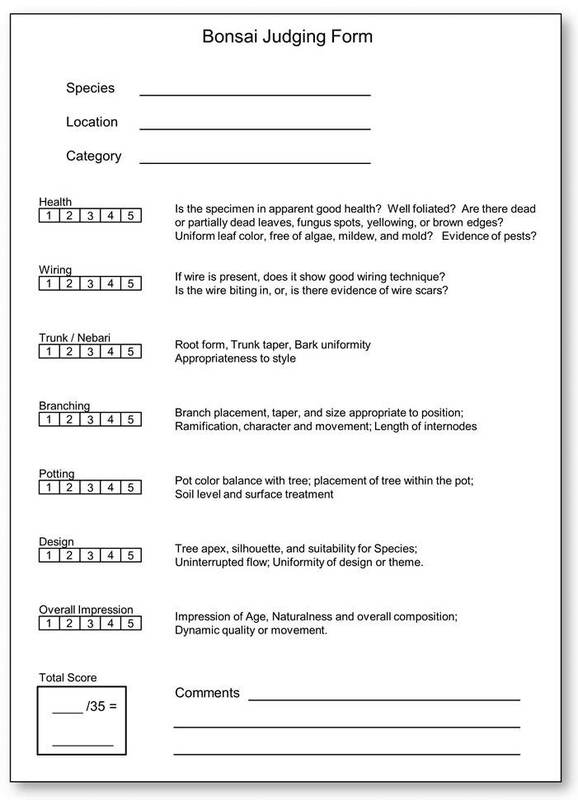 Used to consistently grade soil particle size for particular-sized trees. One of the most routine, yet most critical, aspects of raising bonsai, is the need for periodic repotting. the plant often takes on a lackluster appearance, and the time for repotting has arrived. dormancy; while many feel Spring, just prior to bud break, is the best time for repotting. minimal stress. As such, Spring repotting advocates are getting busy just as their trees begin early growth. 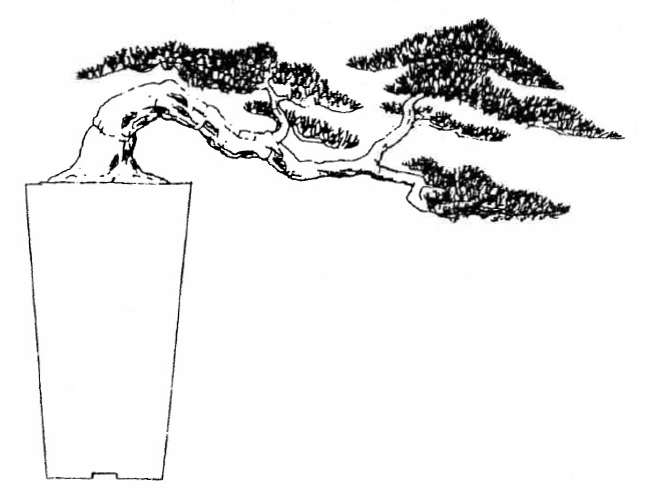 resembling inside shape of the pot (the plant is “rootbound”). Notice the tightly shaped root mass below. We often find these roots wrapped multiple times around the inside of the pot. as seen below. The tender white fleshy roots are easily damaged. the tree will die. A good general rule of thumb is to remove no more than one third of the root mass. no major negative effects, and in fact will usually thrive from the new growth that will occur after the pruning. While roots are exposed during the pruning process, keep them moist with a spray bottle. replace drainage screens, and install fresh hold-down wire as seen below. cases four wires are needed to properly hold the tree steady in the loose bonsai soil. 30 minutes or more, thoroughly soaking the roots and allowing soil particles to absorb water. watering space has been left below the pot rim, allowing water to stand above the soil during watering. This introduction to bonsai repotting has shown the essential steps in the process. 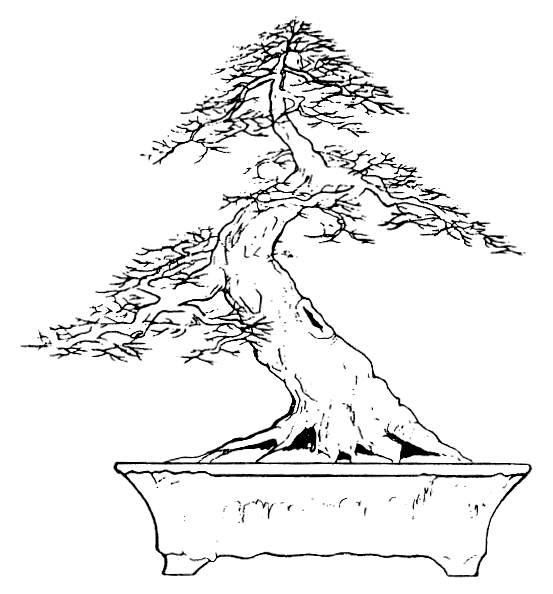 a bonsai group for more information, experience and support. used should not be distracting and, finally, the specimen is evaluated in terms of its maturity as a bonsai. 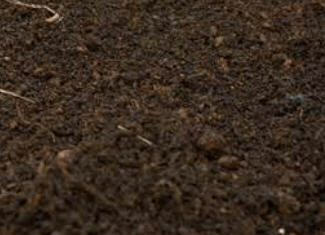 specie and the soil should be stable and capable of providing for the needs of the plant. hide exposed roots. Pots should be clean and lightly oiled to bring out their best patina. and its container should convey a feeling of stability rather than one of stress. Wire, if used, should be applied evenly, in the appropriate size and without crossing one wire strand over another. placed to hide faults. Foliage and branch pruning should not leave dead tips and unsightly stumps. “completed” is an indication that it may have reached aesthetic maturity. is the Japanese art of growing ornamental, miniature trees. with formative techniques applied to create an aesthetic shape and the illusion of age. 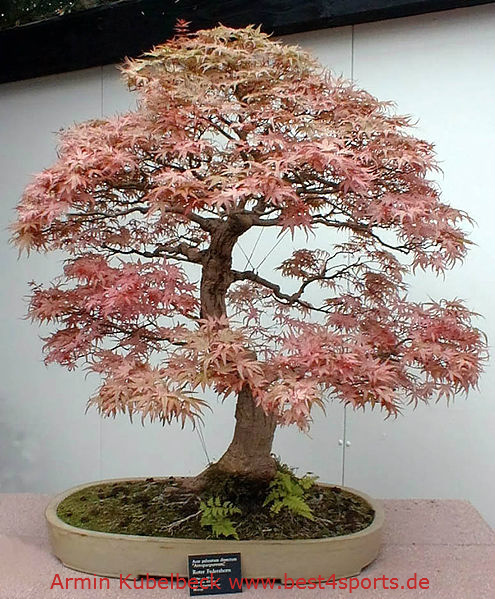 At its basis, then, the art of bonsai seeks to re-create nature in a miniature form. 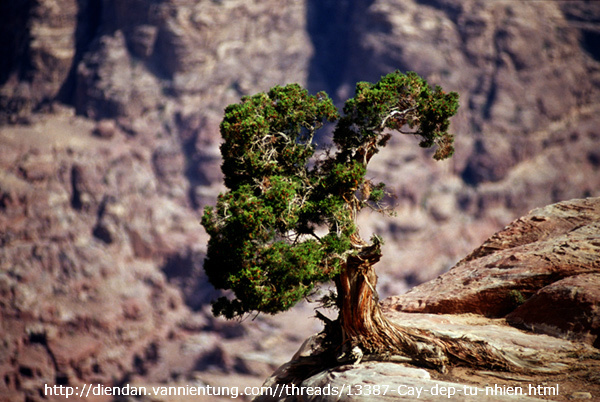 A bonsai specimen is not a genetically dwarfed plant. It is kept small by shaping and root pruning. It is claimed that a properly maintained bonsai can outlive a full size tree of the same species. as one begins to practice this art. A few of the more important points are discussed here, in no particular order. In selecting your first tree, choose a species that is sturdy and “forgiving,” that will be easy to keep alive. 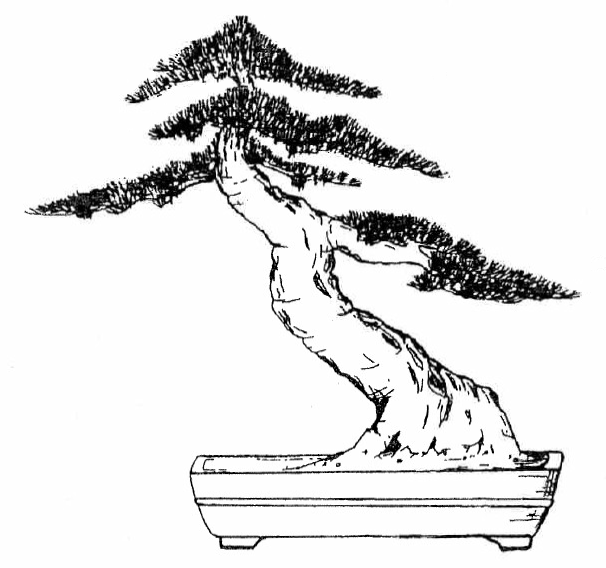 bonsai specimen is often a bush or small tree in your yard. “how many trees have you killed?” Don’t start with an expensive tree! Bonsai specimens, often living in a very small amount of soil, must be watered frequently. that requires an outdoor environment. As we gain experience we often choose more challenging trees. The greater the difficulty, the greater the reward…. produce smaller leaves; but these advanced techniques should be left to the more experienced bonsai artist. 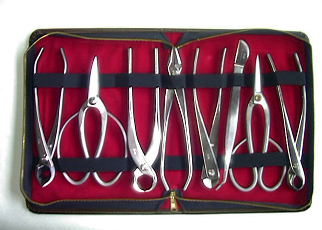 The beginner can start with tools such as simple gardening tools, small pointed pruning shears etc. 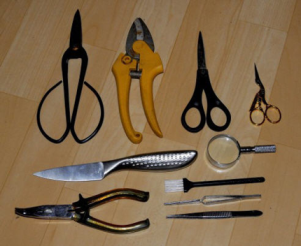 Actual bonsai tools, crafted specifically for the tasks at hand do cost more and can be quite expensive. more specialized tools made for bonsai tasks. A wealth of reading material for the beginner can be found at on-line book sellers. 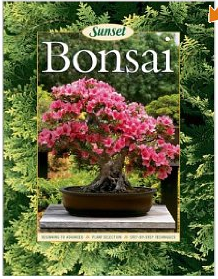 A particularly good primer-level book is Sunset Publications’ “Bonsai” (2003) by Susan Lang. It is now out of print, but can still be found at many book sellers at a reasonable cost. Required items include a tree (of course! 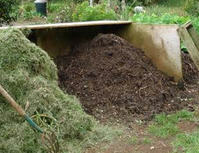 ), some well-draining soil, a pot, and a few tools. learning different bonsai styles, becoming experienced in pruning and wiring techniques, just to name a few. a ceramic bonsai pot must have one or more holes in the bottom, and feet, to let the water drain out. 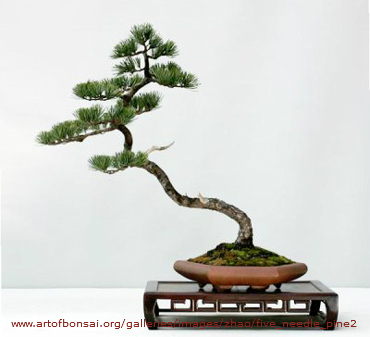 available and begin to enjoy the art of Bonsai. where you will be able to get helpful advice and answers to your questions. Ask a dozen bonsai artisans about how to fertilize bonsai, and you’ll probably get a dozen different answers. based on tried-and-true practices developed over the years. branches to become more brittle. until early June, then stop for the summer. Apply once more in mid to late September. mixture, as flies love to lay eggs on the pellets/cakes, and maggots will otherwise be appearing soon. at one fertilizer application, then use different locations at the next feeding, to best reach all the roots more evenly. but will eventually leave a dirty thin film. closed up by twisting the thin wire or string, and then laid flat on top of the bonsai growing medium. 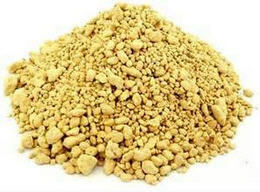 application of these substances can be alternated every week or two. from being fertilized with Miracid monthly. from an imaginary vertical axis. important to decide which style best suits the natural design of the tree and how it grows in nature. 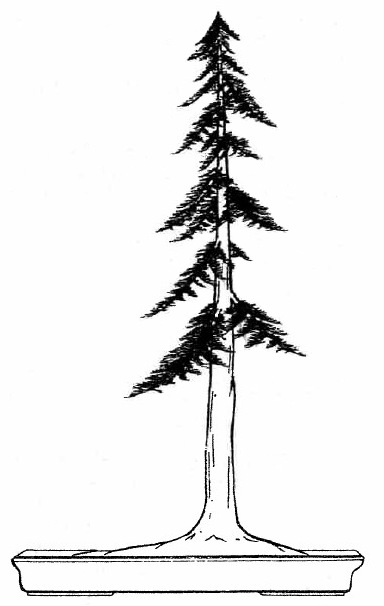 powerful taper in the trunk as it extends upwards from the base. and the apex situated over the base of the tree. The slant style empasizes a slanted trunk that flows to one side, with an offset apex. the tree in place, i.e. the tree should never appear as if it is going to fall over. A more extreme example of the slant style is called windswept. primarily to one side, but without the shape dropping beneath the bottom of the container. usually with curves in the trunk and branches extending from the sides of the trunk.